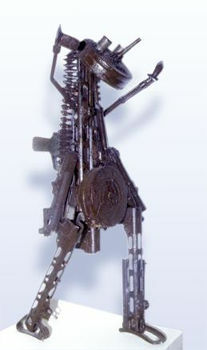 Arms into Art?is an ongoing exhibition of sculptures made from old weapons by Mozambique artists.? ? After 17 years of civil war Mozambique was awash with weapons? so a scheme called?“Transformacao de Armas en Enxadas ” (Transforming Arms into Hoes) was started 10 years ago by?Bishop Dinis Sengulane. People were asked to hand in their weapons in exchange for something productive that they could use to build a new life such as a farming tool or sewing machine.? 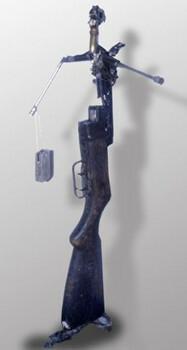 The weapons were then broken down and transformed into pieces of art such as the? “Throne of Weapons” and? “Tree of Life” – illustrating peace and prosperity.